There are several mountain passes in Alameda County. The Altamont Pass is so steep that my V8 Ford F150 had trouble staying at 65 mph climbing over the pass from Stockton. Railroad companies must have had great difficulty designing their tracks to go over this pass at a 3% grade. 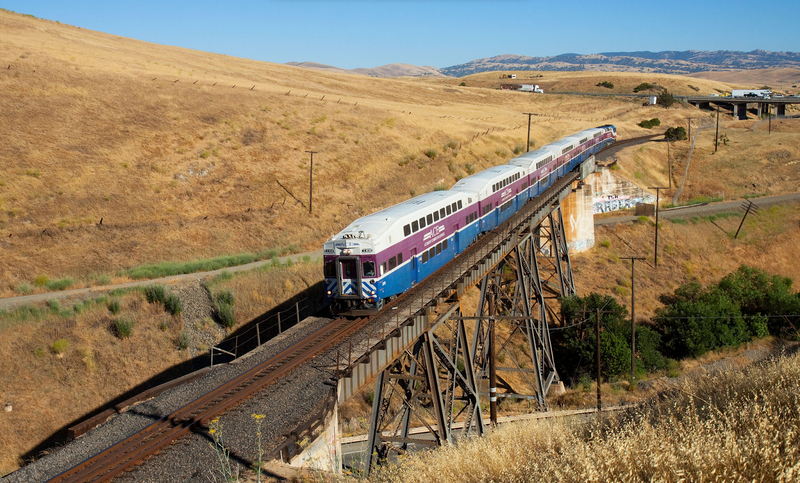 The Altamont Pass Road Underpass (33C0013) was originally owned by Union Pacific but has found increased usage as part of the Altamont Corridor Express from Stockton to San Jose. I read that they are planning to eventually make this corridor part of a high speed rail project from Las Vegas to San Jose. The bridge is next to a dirt bike track. I was amazed at how the young riders could accelerate on the little hills and fly into the air for what seemed like 10 seconds. Someone has done a nice job painting the through girder span and south abutment on this 425 ft long steel trestle bridge. The bridge was constructed in 1908 (and improved in 1919) The towers are assembled with rivets. The bridge is composed of eight spans including the shorter girder spans between the tower legs. The bridge crosses over Altamont Pass Road and Altamont Creek. It took me a while to realize the creek passes between the legs of one of the steel towers. Alameda County, California Bridges: Altamont Pass Road Underpass by Mark Yashinsky is licensed under a Creative Commons Attribution-NonCommercial-NoDerivatives 4.0 International License.